For those who wish to enhance their experience in Thailand. 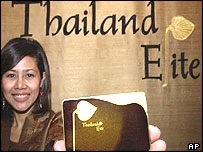 For the personage who sees a benefit in taking their relationship with Thailand a step further. For the figure who desires to take advantage of many privileges on offer, both for business and pleasure.